Our prime concern is to fulfill variegated requirements of the clients, all the time. And, to achieve this objective, we have installed a capacious warehouse. When it comes to payment, we offer convenient and practical methods to our clients. We undertake both online and offline payment methods which are hassle free and safe for the clients. 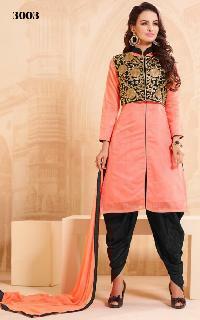 Sahida 3 Designer Suits have a soft and comfortable fabric with a slit cut at the bottom and medium sleeve length.